This year’s Budapest Spring Festival (5th – 22nd April 2019) opened with a concert performance of Khovanshchina, reconstructed by János Bojti. The key word is reconstruction as Bojti went back to original sources and after many years of painstaking diligence he produced a version, which was faithful to Mussorgsky’s intentions. Bojti finished the reconstruction in the year 2000, but it was only now that the version finally had its premiere. Mussorgsky died in 1881 at the age of 42 while still working on Khovanshchina. The second and fifth acts were not completed and only a few of the scenes were orchestrated. Based on the autograph piano score, in 1883 Rimsky-Korsakov published his own version with orchestration completed but differing from Mussorgsky’s orchestration and with revisions both to score and dramaturgy. This version was premiered in 1886. In 1958 Shostakovich issued his own version of the opera. He too used the autograph score but made alterations and additions to it and his orchestration evidently ignored the few scenes orchestrated by Mussorgsky. Having heard several times both the Rimsky-Korsakov and the Shostakovich version, I found Bojti’s return to Mussorgsky’s original intentions as deeply moving as beautiful. Bojti most convincingly proved that Mussorgsky did not need improvement. Yes, the orchestration had to be done but the few scenes orchestrated by Mussorgsky (as well as some of his other compositions) gave the direction. Completing the unfinished second and fifth acts in Mussorgsky’s spirit demanded substantial detective work (by collecting all available sources and information) which Bojti successfully negotiated. The venue for the performance was the concert hall of MÜPA, a magnificant cultural centre built next to the river Danube in 2005 and awarded the FIABCI Prix d’Excellence for its architecture in 2006. The acoustics of the concert hall are excellent but accommodating several large ensembles and several soloists in the hall is no mean task. The performance was meant to be a concert performance but all solo singers did their dramatic best (with or without score in hand). Most of the solo singers were from the former Soviet countries, thus their Russian was impeccable. I hasten to add that, unusually for such a large cast, none of the solo singers let the side down. On the contrary. Some had more intimate knowledge of their allocated parts than the others (and were therefore able to sing from memory) but singing was of fine quality all way through. Elena Maximova (Marfa) must have performed her part many times and was fluent musically as well as dramatically. Apart from her beautiful concert dress (which an Old Believer would have been unlikely to wear) she was the ultimate Marfa. It was not clear why the ladies of the choir at times sat on stage when they were not singing, yet the gentlemen made their entries and exits more often. The entry/exit of the children’s choir in Act I was evidently well-organized and delivered with great discipline. 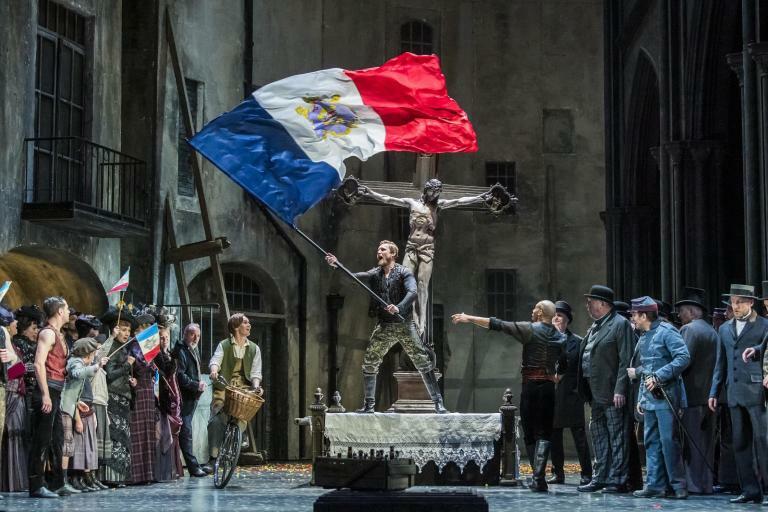 All chorus numbers – very important in this opera – were very well sung. The short number by the ladies in Act IV, Scene 1 (repeating the word ‘ladou’ several times) was beautiful beyond description and, for me, summarised the suffering and tragedy of the conflicts between old and new in the opera’s plot as well as in Russian history. The orchestra, usually in the radio studio or on the concert stage, might have felt out of place lower than the stage and out of sight for most of the audience but they rose to the occasion. Their brass section had several opportunities to shine well above the stage and they delivered with gusto and without any cracked notes. Conductor János Kovács is a hidden treasure. He is known in Hungary but how many people have heard of him outside Hungary? Marketing may not be his forte but disciplined and profound music making is the hallmark of János Kovács. Possibly new to Khovanshchina, he nevertheless presided over a deeply moving first performance of what might have been Mussorgsky’s intention for the completed opera.